I spent a week in January 2009 (from the 10th to the 16th) in South Texas. 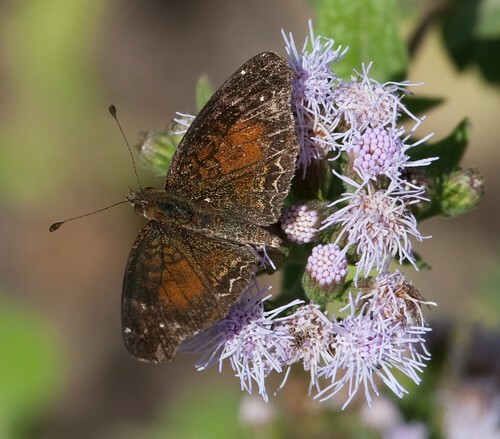 This trip was by myself and covered from Zapata to Brownsville looking for birds with some butterflies and dragonflies thrown in. I had originally planned on heading as far east as Laguna Atascosa and South Padre Island but ended up not going quite that far. As it was my first time down there, I didn’t spend a lot of time looking for individual birds but just wanted to experience a bit of everything. 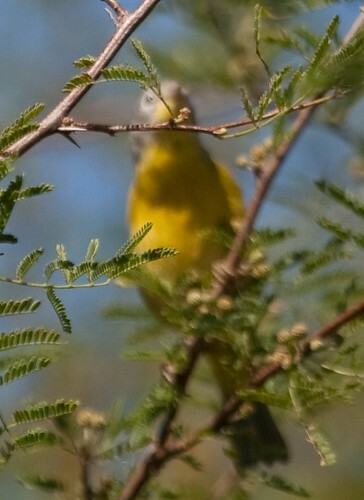 Consequently, I missed most of the harder to find species and the vagrants that were present (Blue Bunting and Crimson-collared Grosbeak among them). 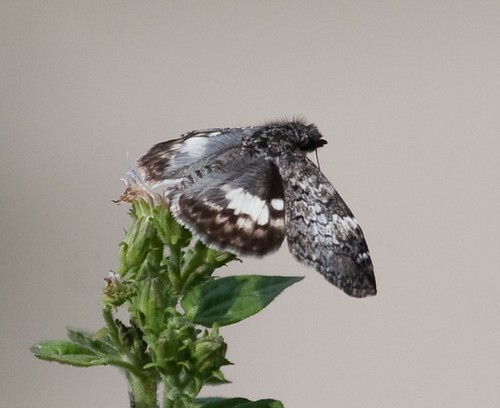 I ended up with somewhere around 115 species of birds, 40 butterflies, and 12 dragonflies, including plenty of new everything. 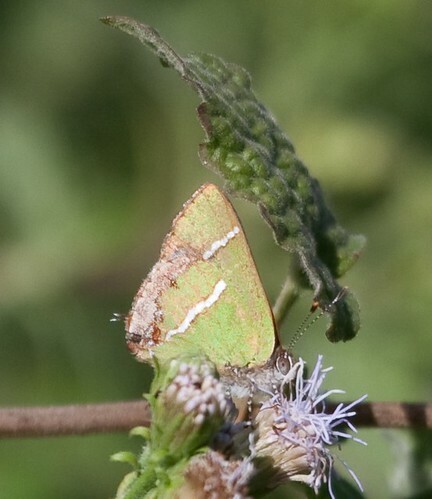 This report will include daily summaries as well as a wrap-up and a species list. Also see the two posts I managed to make during the trip: after day 1 and heading home (not that those won’t be repeated in the daily reports). Here’s a few notes about the trip (travel, car, hotel, food) and then complete lists of what I saw. I flew on AirTran from Boston to San Antonio. Although San Antonio was a bit of a drive, round-trip was about $250 and Mission and other nearby airports were all well over $500. I also got a chance to see my friend Jack in San Antonio (although I didn’t actually have time to see the city). AirTran was quite good. I picked it out of several airlines that were all about the same price because it had the best connections. Although I would have liked one more day, by leaving on Friday I had a noon flight where all the weekend flights were at 7AM. I also had a better layover in Atlanta (several hours) compared to barely an hour in either Detroit or Memphis. I rented the car from Hertz. Although I reserved a Ford Focus, I ended up with a Mazda 6. I have no idea if there was a difference in the cost (the Mazda was more, but the GPS was discounted and this and that) but it was a very nice car. The gas tank was huge and with good mileage I made it almost to Brownsville before I had to fill it (and then only had to fill it again on the way back and a third of a tank to return it full). It had a huge blind spot that took a bit to get used to and I never figured out how to move the wheel so it wasn’t blocking the speedometer. Otherwise no complaints (other than I hit the alarm button every other time I tried to lock the wheel while holding the keys). The cruise control was really nice on the highway (I wish it worked at 5mph so I could scan on side roads without ended up picking up speed). The GPS worked fairly well. I noted a couple places in the trip report where it had issues, but other than not being able to find the hotel the second night none were major. It was definitely a good thing to have. The first night in Zapata was at a Holiday Inn Express. I had issues getting the internet to work and didn’t catch on to the pull ring for the shower but otherwise no complaints. As I mentioned in the report, the room had a view of the water which was really nice. In Mission, I stayed at the Hawthorne Suites, which was fairly nice although it was slightly out of the way and I didn’t really need a full suite. In Brownsville I stayed at a La Quinta, which was quite nice. The Best Western that I picked at random in San Benito was not as nice as the others but nothing was really wrong (wireless would have been nice). And back in Mission, I picked another La Quinta which was also very good. Other than the first night (and that may have as I had nothing that needed to go in and can’t remember now), all the rooms had refrigerators. I didn’t go out of my way for any local food. On the way to Zapata, I pulled off at a truck stop and grabbed a sub. I didn’t really bother with lunch the next day and went to Chili’s for dinner. I stopped at a grocery store for snacks, which included enough for lunch the next day. In Brownsville, I got takeout from Rudy’s, which was fairly good and had enough to save for lunch. In San Benito, I tried Whattaburger, which was adequate for fast food. I had lunch at a Wendy’s in Weslaco and then dinner at Tony Roma’s in McAllen. I was able to have leftovers for lunch and then went to a Mary Callender’s in San Antonio. I bought an Asus EeePc for the trip. It worked out beautifully. Small enough to pack it in my backpack with everything (scope, camera, binocs, etc) but it’s a regular pc. I was able to check email every night and download photos. The keyboard takes a bit to get used to (pretty much every time you pick it up) but otherwise there’s nothing I can really complain about. For $320, it’s well worth it and will be very good on future trips. Today was the last morning of birding before I headed back to San Antonio. As I planned yesterday, I started by heading to Anzalduas. Or at least attempting to. I turned down the marked road and shortly found a giant dirt levee. Figuring that was wrong, I backtracked a bit and continued further but it appeared to be right. I returned, started up the levee, and decided that this wasn’t a great idea (although trying to back down wasn’t either). Since I was planning at Bentsen for souvenirs anyway, I headed over and spent the morning there. I arrived at Bentsen in time for the first tram of the day. Two birders got off by the boat ramp and I got another ride by myself to the hawk tower. For a change, the weather wasn’t great, quite cloudy and I felt a couple drops of rain as I walked out to the tower. There wasn’t a whole lot at the tower when I arrived, mostly the same dabbling ducks that were everywhere. I sat for a few minutes and some of the more distant shorebirds flew in closely. 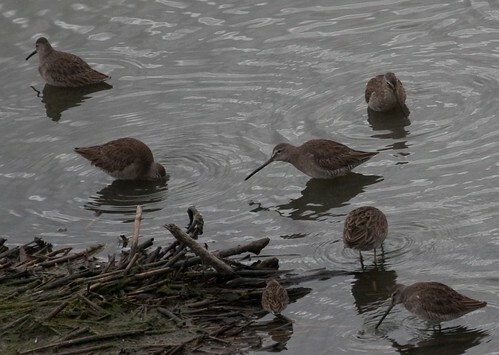 They proved to be mostly Long-billed Dowitchers but there were a few Least and Stilt Sandpipers mixed in. The Stilts were probably among the best views I’ve had, it’s nice when they stick out like that. 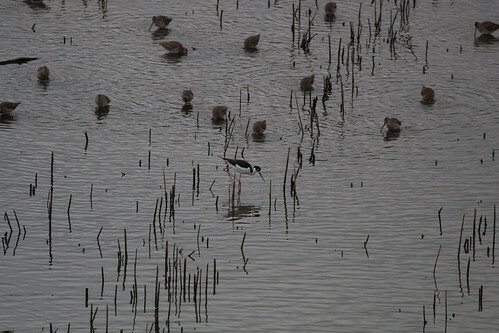 A few minutes later, a Black-necked Stilt joined them as well. Since I still had about 40 minutes before the tram would return, I decided to walk the trail. On the way, my phone rang. The number looked vaguely familiar, but it started with 00. I passed it to voicemail and then noticed I was on a Mexican cell tower. Hopefully I wasn’t a few minutes earlier when I called home. The sign said 1.8 miles around, which I figured would give me plenty of time even if I found something. Fortunately, I didn’t find anything as I barely made it back in 40. Also fortunately, the tram didn’t arrive for a few more minutes. I was planning on taking the tram back to the general area of the boat ramp, but on the way we passed two birders on the side of the road. The volunteer gave them a quick look at shouted “Stop!” He pointed and after taking a quick look I hopped right off. 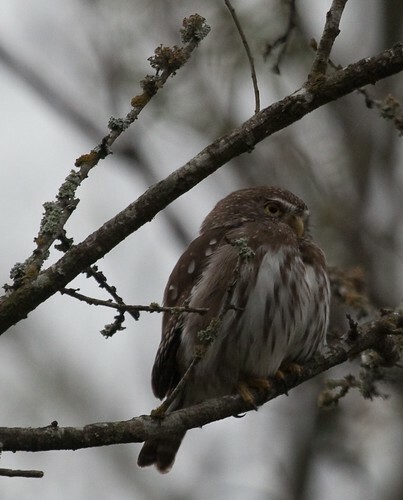 There was a Ferruginous Pygmy-Owl sitting in the trees on the side of the road. Eventually, we all moved on. I started back (actually went too far) but ran into another birder and came back to show it to him. I then worked my way to the boat ramp. 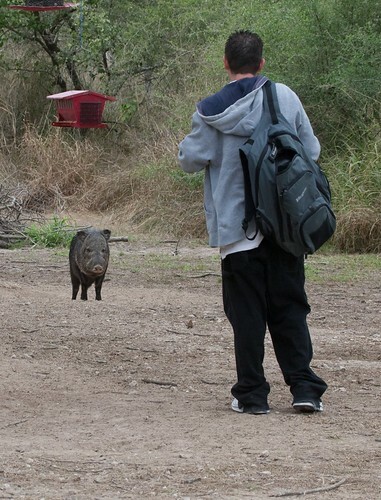 On the way, I passed one of the park’s many feeding stations and found a great scene as one of the Javelinas stared down a park visitor who was trying for a picture. There wasn’t much at the boat ramp, so I moved on to the blind. It was pretty quiet (doves and woodpeckers, no rare buntings), so I wandered around again. I went back to the boat ramp to try for a picture of a male Rambur’s Forktail but couldn’t find any in the cloudy conditions. I then went through the old trailer loop (now the Acacia Trail). Again, there wasn’t much but at the other side was a crowd of people staring at maps. 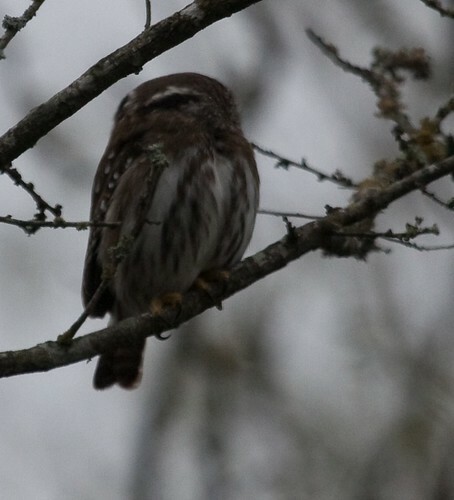 They were obviously on their way to the owl, so I pointed them in the right direction and decided to take one more look before I headed out. 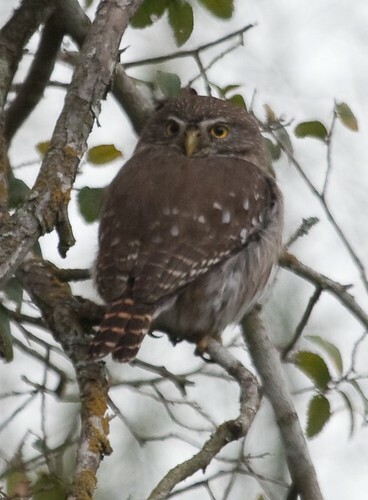 The owl had moved a few trees down and was actually in slightly better light. I started to walk back. On the way I pointed one of the park staff and a few visitors towards the owl. They were all on bikes and looked to be in a rush. Luckily the directions were stay left and look for the crowd of people. 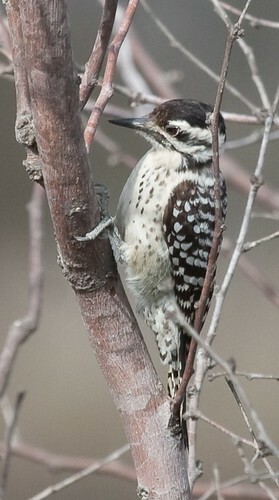 I didn’t find any other birds along the walk back or in the gardens by the visitor’s center. After a quick stop to buy shirts and then a few minutes to finish off the leftover shrimp from last night, I began the drive back to San Antonio. It was pretty uneventful. I hit a couple brief heavy rains early on and was puzzled by the immigration stop near Falfurrias. It seemed to be in the middle of nowhere, but the sign claimed that they had already stopped 1100 illegal immigrants and a significant amount of drugs. I didn’t think it was a smart idea to take a picture of the sign though. At least all I had to answer was “Are you a citizen?” and “Where were you born” before being waved through. A quick stop for gas and then a quick break to stretch and I was in San Antonio. Highway birds along the way were pretty much all raptors, mostly Red-tails and Kestrels with a few Caracaras mixed in. Up until maybe 15 miles from San Antonio the only time I saw more than two cars around me was in the ‘downtown’ areas where a traffic light would cause five cars to back up. But once I got to San Antonio, it got really bad. The last mile of highway probably took 15 minutes but I still arrived at my friend Jack’s house by 5:00. We went out to dinner at Marie Callender’s where the country fried steak provided a nice change. Then back to Jack’s house to pack and sleep. My flight left at noon and I had scheduled the car return for around 9:00, so I was up at about 7:30 and on my way by 8:30. A quick stop for gas (with a broken pump that started charging me before I put it in the tank and then spilled all over) and I was at the Hertz in 15 minutes. For at least the third time on the trip I set off the alarm while fumbling with the keys. At least I was able to stop it immediately this time. The shuttle back to the airport showed up right after I finished the paperwork. Baggage check in took no time and I was through security easily (the guy checking things was actually friendly and was impressed by the size of my EeePc). The flight to Atlanta was right on time. I had a layover of several hours in Atlanta. I started to look for food, but decided to just grab an ice cream sandwich out of a vending machine for now. I found the gate and sat down. Although there’s supposed to be a charge for wireless, the gate happened to be right next to the Continental President’s Club and I was able to pick up their free connection. Not too long after I sat down, the fire alarm went off. It specifically said to not do anything unless told but I didn’t see anyone even bat an eyelash. Twenty minutes later, it actually stopped. Eventually I got hungry and found a Nathan’s (the food at the other terminal was much better). We finally boarded the flight home and then proceeded to sit on the runway for 30 minutes. I was sitting next to a soldier who told me that he hadn’t slept at all last night and was heading out with friends as soon as he got in (we were supposed to arrive around 9PM) and then started pestering the stewardess about what type of booze they have available. Luckily he promptly fell asleep once we were in the air. The flight ended up landing pretty close to on time and surprisingly my bag was about the second one out at the baggage claim. And that was the trip. 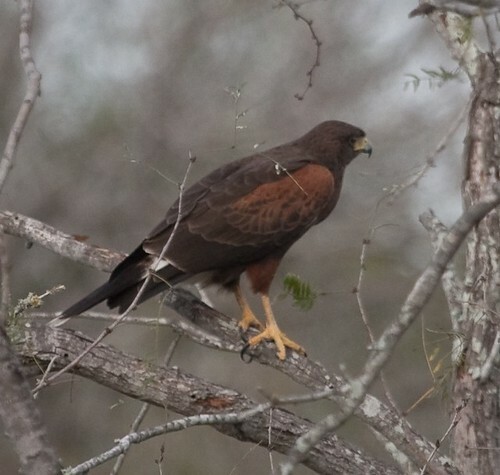 Today started with the weekly bird walk at Estero Llano Grande. 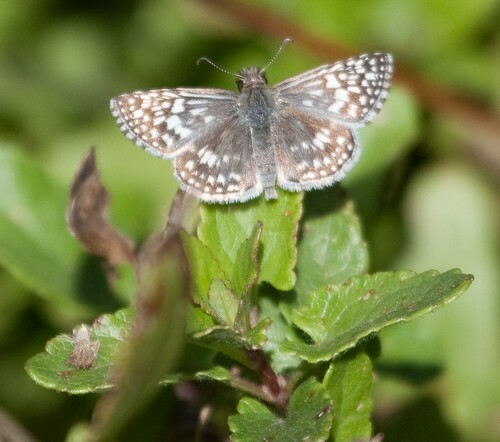 I joined the walk as it heads into restricted areas of the park, which is where all the rarities have been seen. We ended up missing all of those, but it was well worth it anyway. The deck by the visitor’s center had a fabulous view of the water and I picked up the first lifer of the day from there with a Green Kingfisher perched in the open (finally). The walk started a bit late and as we milled around, someone called out that the Buff-bellied Hummingbird was near the feeders. I rushed over and got a nice look as it spread itself out to warm up in the morning sun. Eventually the walk began. With over 40 people, we split into two groups and I went with Dave and Mary Elder to tour the park while the other group went right into the restricted area. We started by admiring the kingfisher, Least Grebes, a Vermilion Flycatcher, and many Kiskadees over the water and then checked the feeders. 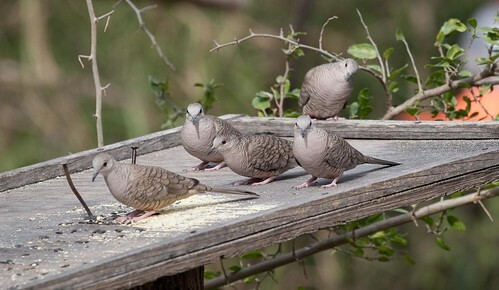 The feeders had a bunch of doves, chachalacas, and a couple Hispid Cotton Rats. 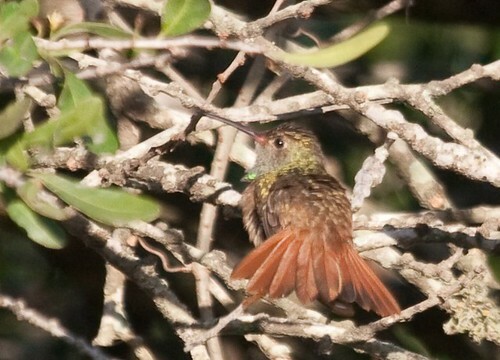 The Buff-bellied was still around and two other hummingbirds joined it. One was identified as a Black-chinned, but the other got away. 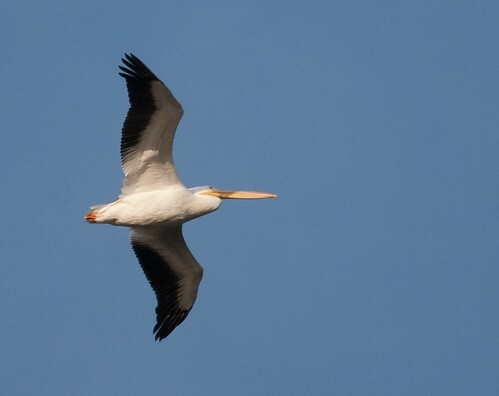 We then headed down the trail and admired the large flock of American White Pelicans and other birds in the water. Someone picked out a Sora and we would later hear a couple more. 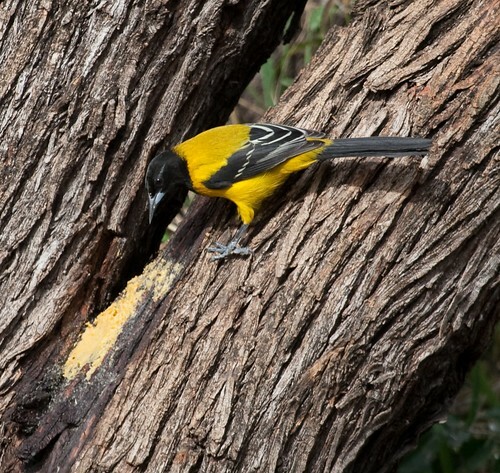 Further down the trail, Dave stopped and pointed “Pauraque!” After a moment of shock, we realized that they were staked out birds that roost in the same spot every day. Even though he knew they were there, we could only find two of the three birds (and when I came back later I couldn’t even find the second). 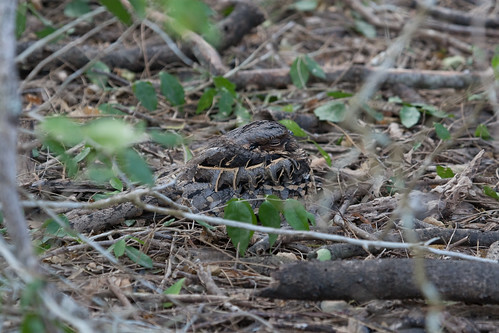 Amazing camouflage. We continued on to the Alligator Lake. A few people did see a gator, but I never found it. However, another Green Kingfisher put on a good show, as did several species of herons, an Anhinga, and a Tropical Kingbird (very nice to be able to see and hear both on the trip). We then moved on to the levee. There were a lot of birds in the water, but they were all a bit distant. We were able to pick out numerous American Avocets and Black-necked Stilts and the locals were all excited by a flock of Fulvous Whistling-Ducks (apparently much less common than Black-bellied here). Dropping back down to the grassy area, we kicked up a bunch of sparrows that proved to be a mix of Lincoln’s and Savannah (causing some confusion as we were told that the local Savannahs look different as several of us got on a Lincoln’s). We then worked towards the former trailer park, which is the closed area. On the way, we stopped for a Red-shouldered Hawk and found a Cinnamon Teal in with the rest of the ducks. The teal was another much-wanted lifer and was a spectacular as I hoped. 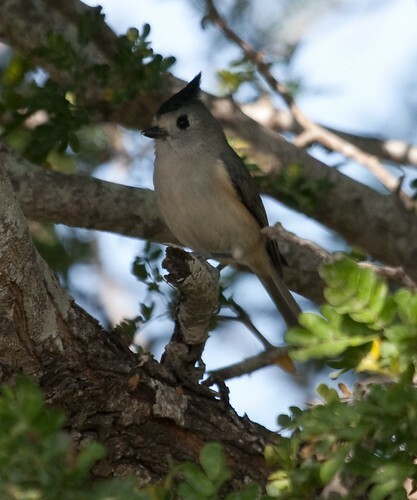 At the trailer park, we learned that the Becard had shown very briefly but there had been no sign of the Black-throated Magpie-Jay (an escapee but apparently spectacular) or the Blue Bunting. 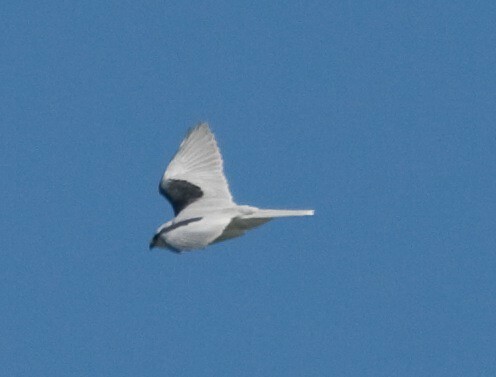 We sat around for probably 30 minutes but had no luck (other than a very quick White-tailed Kite flyover). That ended the walk. I was hungry and found a Wendy’s nearby where I planned my next move. I was thinking about Frontera and chasing Crimson-collared Grosbeak and Blue Bunting but decided I’d rather go for a bit of a drive and chase Masked Duck first. The ducks were in Raymondville, probably 40 minutes away, but it was a very easy drive. As I drove up, there were three people scanning. I hurried over but it turned out that they had not found the birds (and the out-of-state visitor appeared to have no scope). 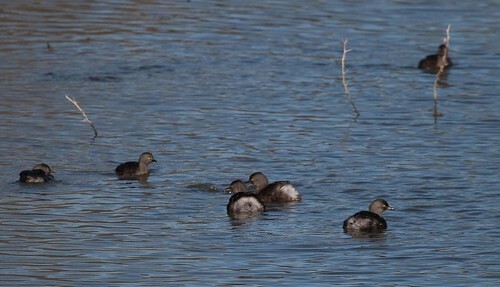 I worked my way down the road slowly and sorted through lots and lots of dabbling ducks but no others. The other people left fairly quickly and I began a more systematic search. Still no luck with the Masked Duck, but I found more Cinnamon Teal and also had some White Ibis and Wilson’s Snipe in between a couple of the ponds. 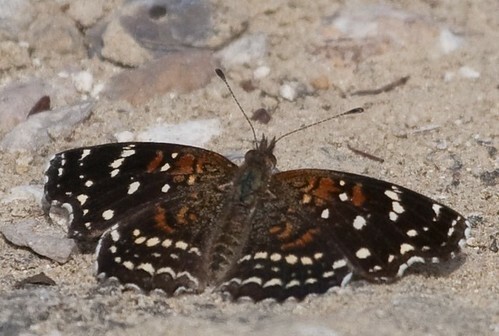 A Ladder-backed Woodpecker popped up and there were a few butterflies including a very nice Buckeye and some Fiery Skippers. Eventually, I gave up and headed out (I would later find out that they hadn’t been seen for a couple days and were not seen again). 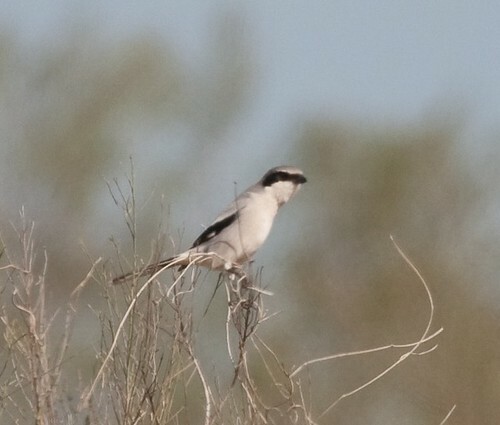 On the way out, a Loggerhead Shrike posed in the open, so I stopped for a second. I had learned earlier today that the Least Grebe numbers were way up this year, but on the way back I was still surprised by two in what appeared to be an irrigation ditch along the side of the road. Apparently way up is understating it. I planned on heading to Frontera now, but it was after 3:30 when I arrived and the sign said they closed at 4:00, so I decided to just go back to Estero and wander around on my own. I started with a few minutes getting better shots of the Pauraque (the ones above) and then sat at the Alligator Lake again. This time there was a big turtle with a Spotted Sandpiper right next to it but not much else. I also spent some time on the Camino de Aves, which is a drier area. It wasn’t particularly birdy, although I did find a couple Harris’s Hawks (and a smaller raptor that got away), a Common Ground-Dove and an Orange-crowned Warbler that put on a show. 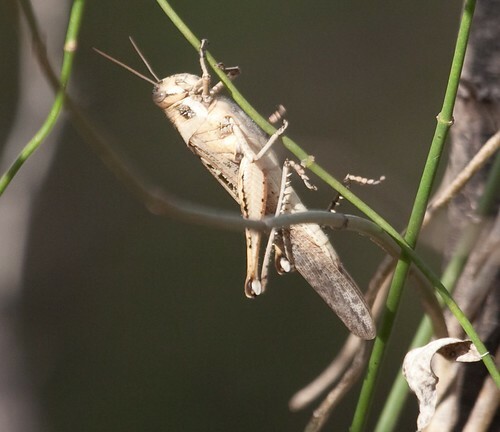 A Gray Bird Grasshopper, which is one of the giant species hopped up as well. I then walked around the ponds (and watched the idiot who had come by earlier pishing nonstop and not getting anything beyond a yellowthroat walk right down a closed maintenance road). 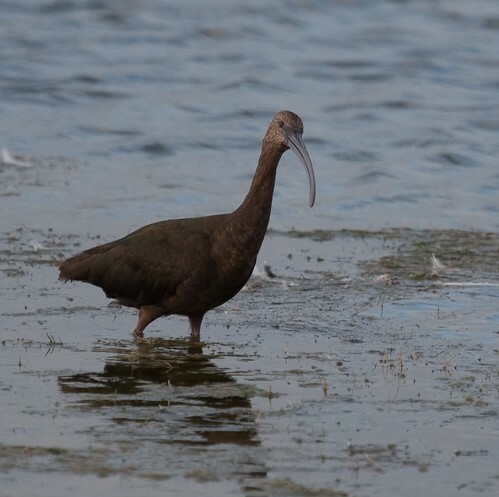 The light was a bit harsh by now, but the first pond had two cooperative White-faced Ibis and a Vermilion Flycatcher. I then returned to the car and headed to Mission to find a hotel. One of the first ones I saw was a La Quinta, and since I found the one in Brownsville very nice, I stopped. I ended up with the room right next to the elevator but didn’t hear a thing. For dinner, I headed to Tony Roma’s. The food (grilled shrimp) was fairly good although the service was fair. There was a large birthday party at the table next to mine, which may have kept the waiter busy. They were taking a bunch of pictures and eventually asked me to take one of everyone. I was handed one of those single-roll cameras and realized I could barely see through the viewfinder. I’m fairly sure I framed it correctly, but if I didn’t, oops. They gave me a piece of cake, which was quite good even if I really didn’t want it. I got back to the hotel and planned out the next day. I was thinking about Anzalduas County Park and then a quick stop at Bentsen for t-shirts before heading back to San Antonio. As I noted in yesterday’s post, I scaled back today and headed to Resaca de la Palma. This is a brand new state park (open about 5 weeks) that has been getting good reviews. On the way over, I had noticed a birding trail sign right by the hotel, so I took a swing by. I believe it was for site 44, the Fish Hatchery. Partway down the road, two dogs ran in front of me, which caused a bit of a delay as I couldn’t see whether they had moved or not. I got down to the end of the road and didn’t see much habitat (reading the description later, I think I needed to go down to the right a bit), so I turned around and headed to Resaca. On the entrance road, I picked up yet another flyover life when several Long-billed Curlews passed over (unfortunately I never got them on the ground). I found the parking lot and checked in. Arriving at 8, I was told the tram wouldn’t leave until 8:30 and that there was a short trail right there. I took a walk down to the end. 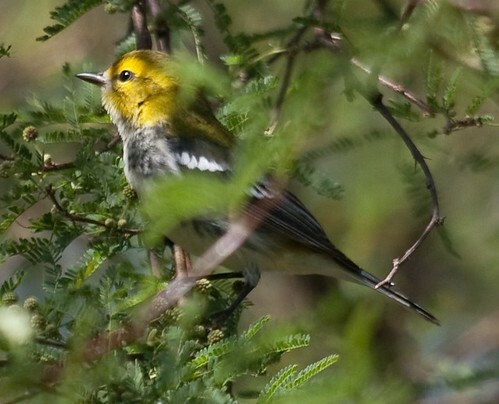 On the way, I found a flock of migrants/overwintering birds that included a Blue-headed Vireo and a Black-throated Green Warbler. At the end was a nice overlook at the water. 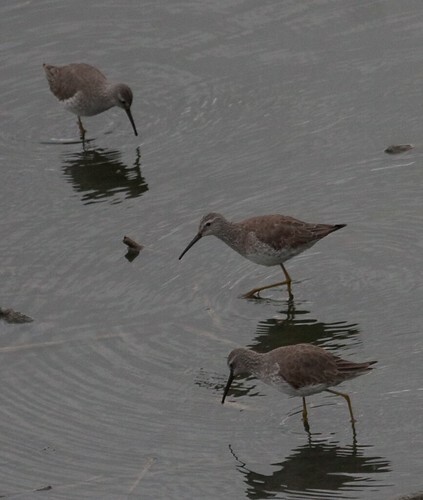 I found a bunch of Solitary Sandpipers, but not a lot more. I got back to the headquarters ahead of the tram and found a couple Lark Sparrows in the trees. The tram driver showed up shortly and I was the only one around for it. 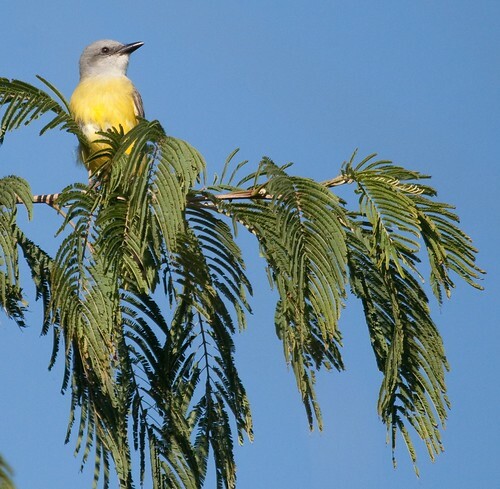 I hopped off at the first stop (a couple more Tropical/Couch’s Kingbirds along the way). The driver told me that he liked the trails up a little further more than these and that I could catch the next tram in about an hour. I walked the short distance to the end of the first trail and immediately had a Myiarchus fly across the water. Unfortunately it disappeared quickly and I have no idea which one it was. 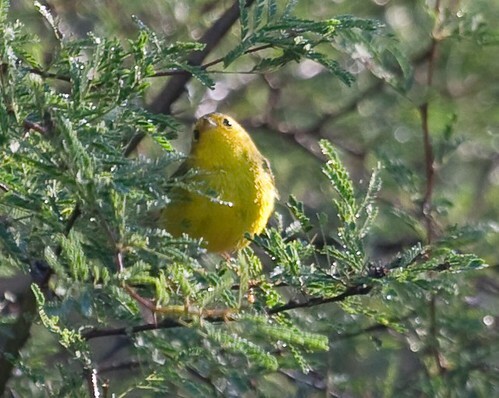 The water was loaded with Least Grebes and when I turned around to go elsewhere a Wilson’s Warbler popped up. We had passed one in the tram. 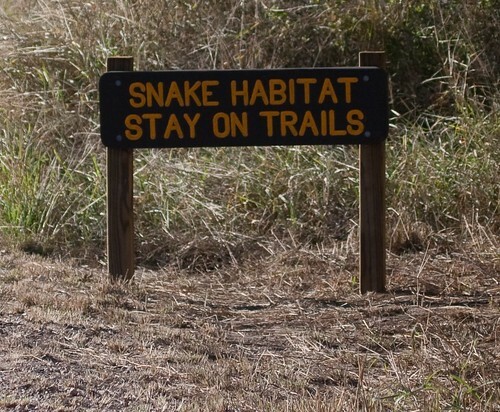 Passing quickly, I had read it as Shaky Habitat. I thought that was an odd way of saying fragile, but this makes more sense. Walking down the road, I found another Blue-headed Vireo. I turned down the next trail (the Flycatcher Trail) and followed the signs to the next overlook. There wasn’t much water around and the only bird at the water was an Eastern Phoebe. 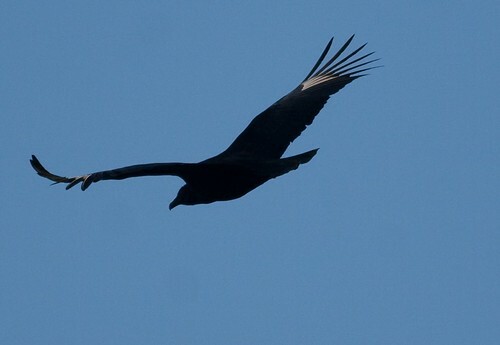 However, scanning through the vultures overhead I found a couple Blacks and later two Anhingas passed by as well. The vultures eventually came in close enough for photos. I continued on and decided to follow the Flycatcher trail all the way around. Not too far down, a couple dragonflies flushed. I waited them out and one eventually landed. 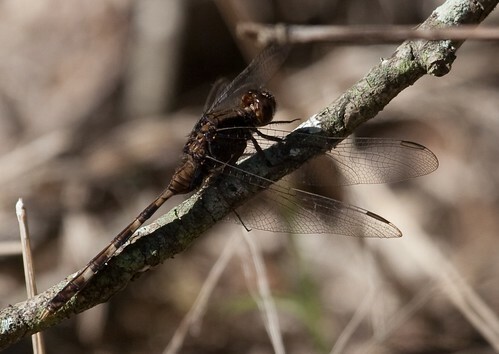 It looked like a darner and I quickly started snapping photos. 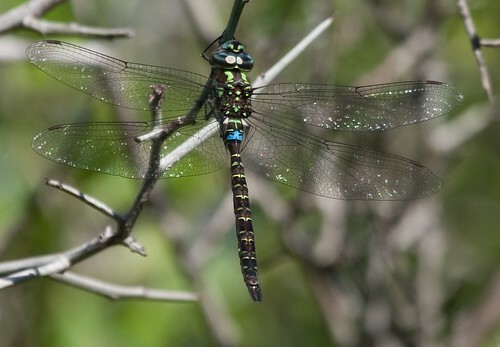 Once back at the car, I was able to identify it as a Turquoise-tipped Darner, another south Texas specialty, although one that appears to be expanding its range quite a bit. Looping around, there wasn’t much else. Several Turkey Vultures flushed out of the trees but that was about it. Once back on the road, I continued on. 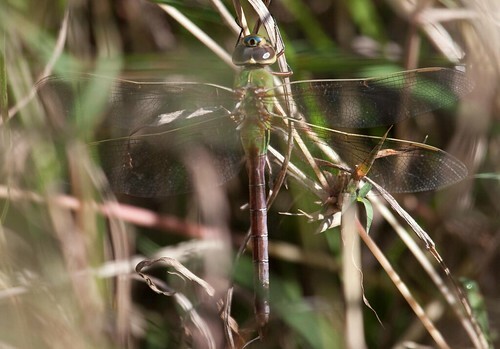 Several Common Green Darners flushed out of the grasses and a surprise Northern Harrier flew by. 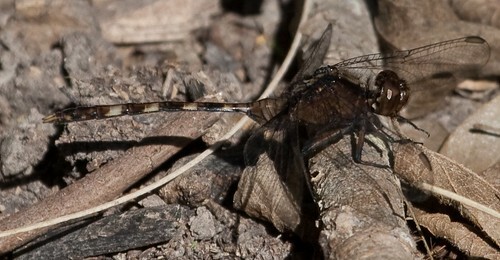 Further on, a nice mature male Band-winged Dragonlet came close to posing in the open. 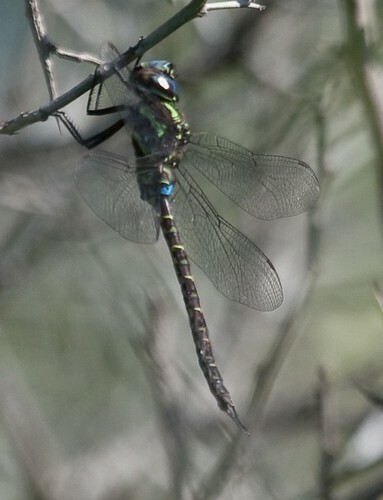 As one of the Green Darners eventually. Further down, I caught something big flying over. It was quite pale but disappeared quickly. 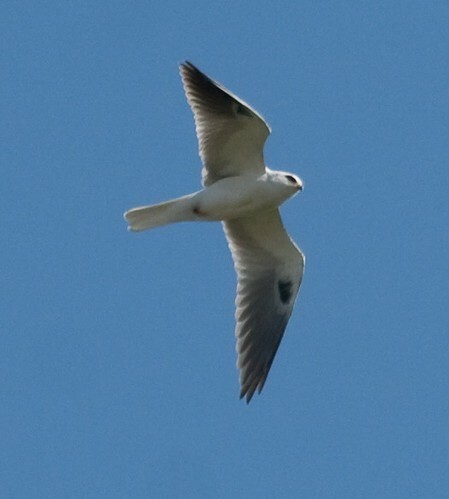 After puzzling for a second because male harrier didn’t seem quite right, I realized it had to have been a White-tailed Kite, another lifer. Again, not the best view. I soon reached the Yellowthroat trail, which runs along water for a good distance and then intersects with a trail that appeared to run back to the road. 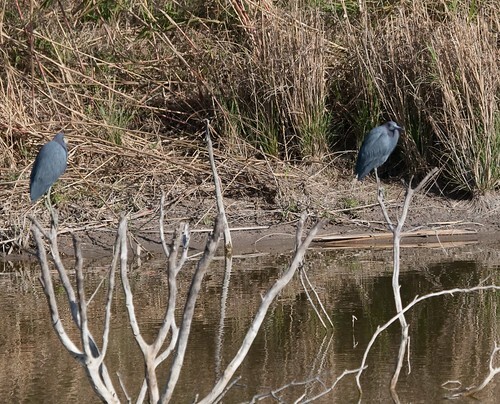 Starting down, there were a couple egrets in the water and some Wood Ducks took off. A bit further down, I came across an Empid. It gave a couple whit notes and then disappeared. I walked back and forth for a few minutes looking for it. 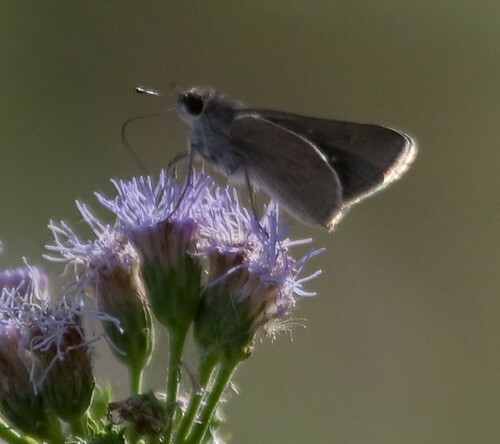 At one point I thought I had it and snapped a few photos before realizing it was just a phoebe, but shortly after I did get a brief view. 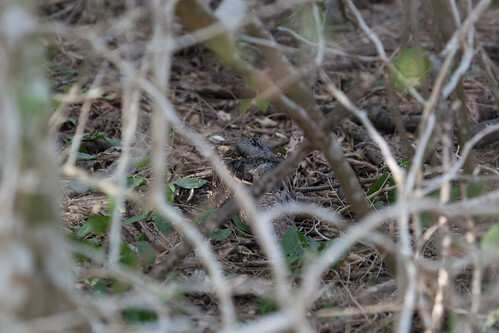 One photo almost came out and from what I could see there was nothing to say it wasn’t a Least Flycatcher. 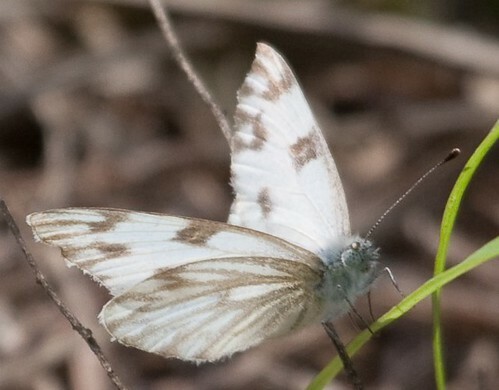 Looping around to the part of the trail that wasn’t by the water, I started seeing a few more insects (lots of Carolina Satyrs all along but not much else before). 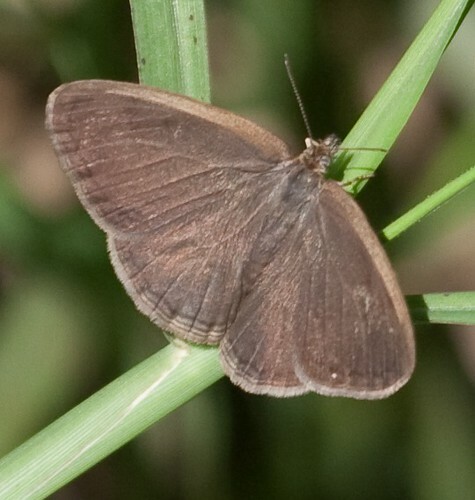 Several Dusky-blue Groundstreaks were flying around, giving moderate views of the blue upperside. No photos of that, but I did get some normal poses. As I passed into one of the real open areas, a Red-shouldered Hawk flew over and was immediately followed by the White-tailed Kite. This time, I was able to watch it for several minutes and then take several photos. I reached what I thought was the trail back, but there was a trail closed sign on the ground (there had been several elsewhere as well). It was down on the ground, but since it was quite windy I wasn’t sure if it just blown over so I completed the loop and then walked down the road. I hoped to catch the tram going by, but it may have taken a noontime break. It was quite hot out by now and very windy. The walk back was not much fun and pretty much devoid of anything. The kite made a couple more passes and some more Anhingas flew over but otherwise I saw nothing until I was almost back at the visitor’s center. 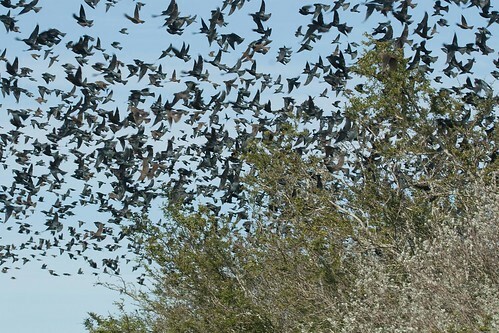 Just before reaching the visitor’s center, I found another flock of birds. 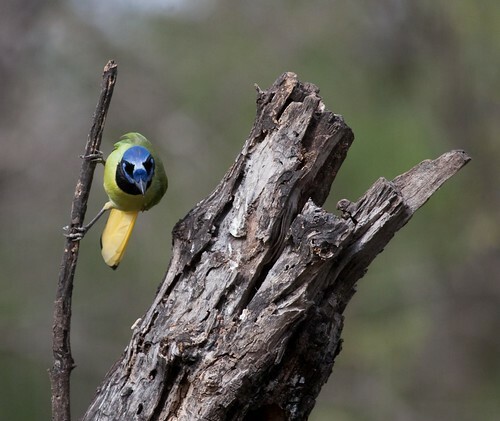 It may have been the original one I saw as it contained a Black-throated Green and a Blue-headed Vireo, but they were also joined by a Nashville (and of course there were Orange-crowns and Yellow-rumps all over). The BT Green posed well, but the Nashville wasn’t as cooperative. 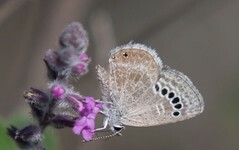 Back at the visitor’s center, I checked out the butterfly gardens. 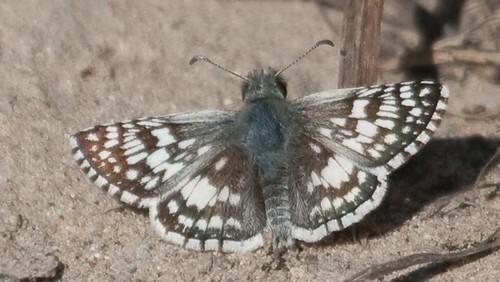 There was a nice White Peacock, a Zebra, several Tropical Checkered-Skippers, a few Reakirt’s Blues, and a bunch of other skippers that I haven’t figured out. One of the park volunteers came by and talked for a few minutes. 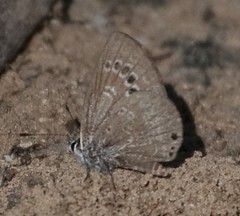 Apparently Blue Metalmarks are fairly regular, but no luck today. At this point, I headed to Sabal Palm. It was a fairly long drive and I munched on the rest of my brisket as I went (I really would have appreciated the leaner cut here). Once I arrived, I checked, grabbed a map and started down the forest trail. It was late in the day and fairly quiet, but since I really wanted to see the Sabal Palms and not the birds, I was ok with that. The forest trail was spectacular and was truly another world. You’ll have to google up images and see what it’s like yourself as I didn’t have a small enough lens to really capture anything. 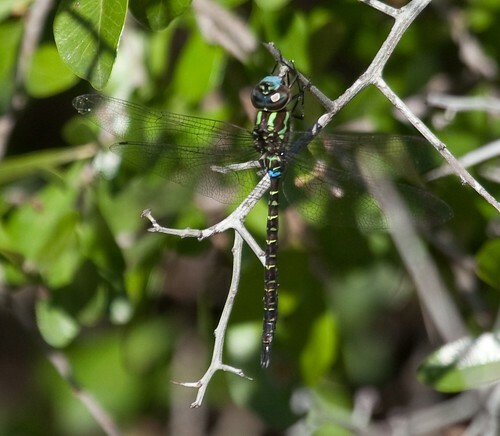 There were lots of dragonflies around, including Band-winged Dragonlets and Pin-tailed Pondhawks. 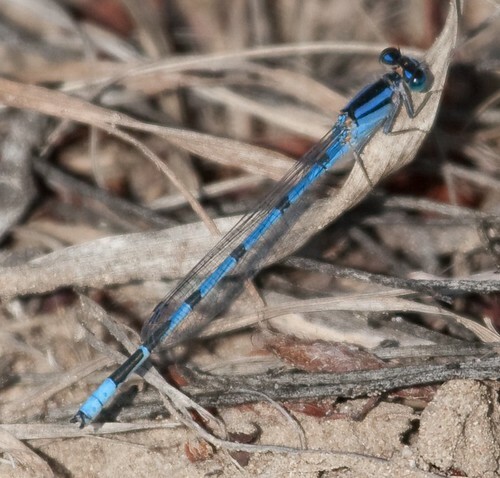 The pondhawk was only suspected to fly year-round, so this should confirm that. 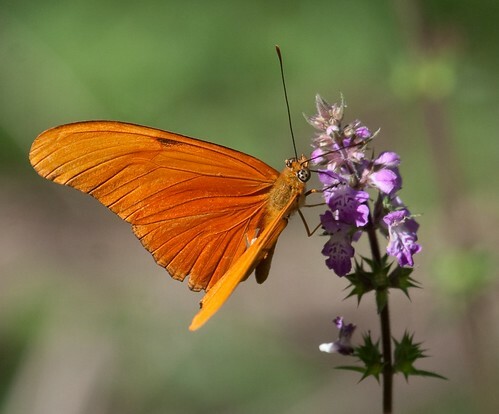 A bit further down, a large, orange butterfly flew by, my first Julia. I took a quick walk to the photo blind. It was crowded and there wasn’t much visible (a few grebes, an Anhinga, a few ducks, and a bunch of turtles) so I moved on quickly. 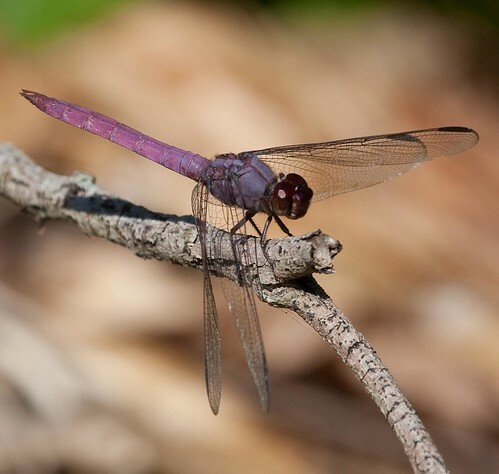 I took the next trail that crosses the water and found one of my targets for the trip, a Roseate Skimmer. What a spectacular bug! 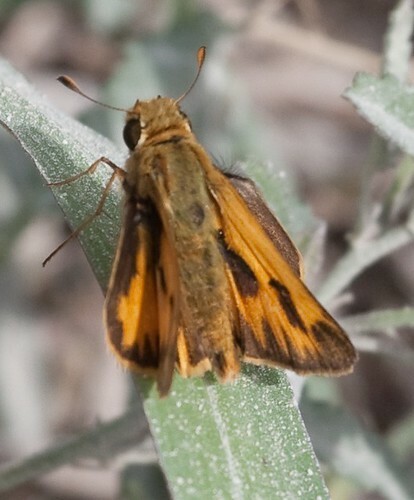 There were a bunch of skippers and a few Kiskadees nearby. I ended turning around and working my way through the rest of the forest trail. 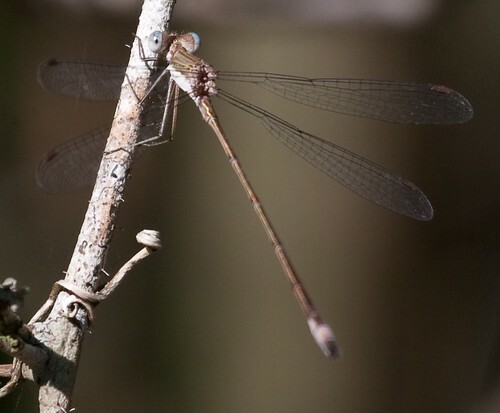 Partway through, I found a spreadwing. The light was quite difficult, but I got a couple acceptable shots. 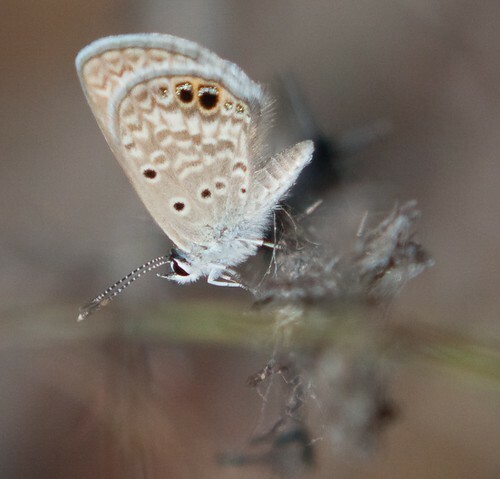 I tried putting on the close-focus filter but wasn’t able to get a good shot with that. 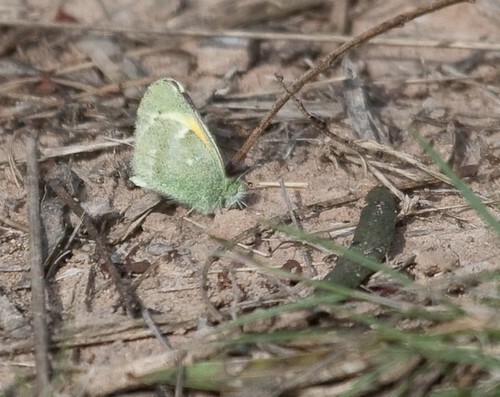 However, it was less flighty than most and I was able to catch it by hand. 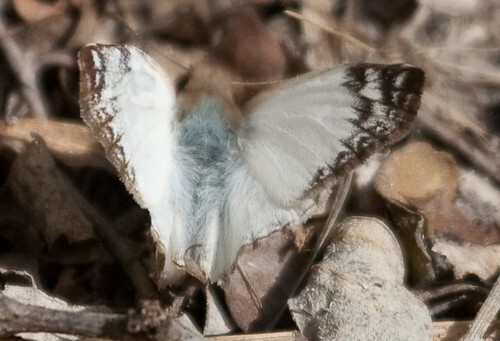 It didn’t settle down to let me get a good look at the appendages, but I did notice a couple dots on the underside of the thorax. 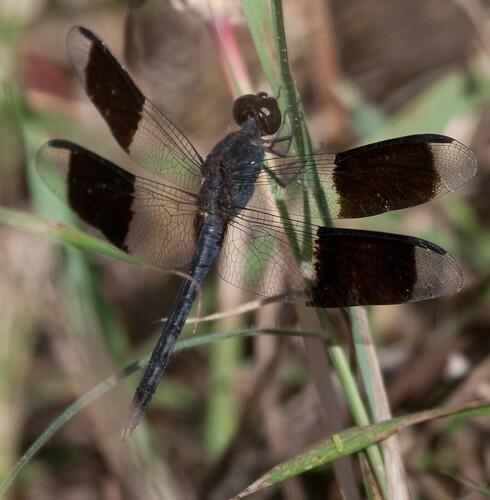 Back home, when I posted my sightings to the Texas ode list, Dennis Paulson identified it as a Rainpool Spreadwing. Searching around, the dots do appear to be a mark, although I’m not sure if they’re diagnostic and if you can see those, you can probably identify it in other ways. 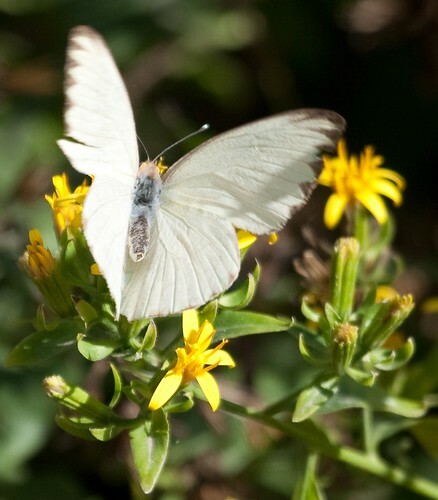 After finishing the forest trail, I checked the butterfly gardens and then took the river trail. I was rather disappointed as there turned out to be no view of the river. There also wasn’t much around other than Turkey Vultures and a single Osprey. After making the loop, I found the overlook at the river and realized it wasn’t that disappointing to be hidden. But since it was a good place to sit and I was tired, I stopped for a few minutes. There was a sparrow-like chipping coming from a tree back up the path, but I ignored it. A youngish kid and his father walked up and the bird flew into the open. 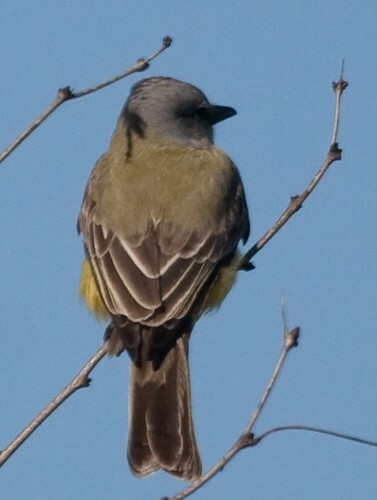 It wasn’t a sparrow, but a kingbird. 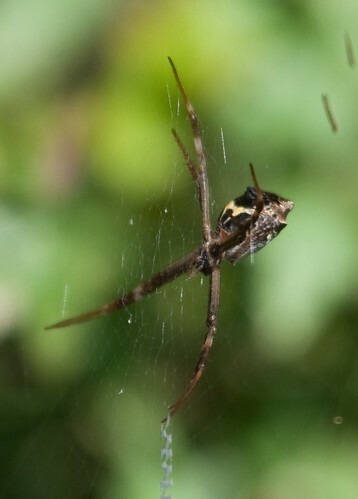 I snapped a couple photos and watched it for a few minutes. I was pretty sure the vocalizations were correct for Couch’s but decided to go back to the car and double-check. 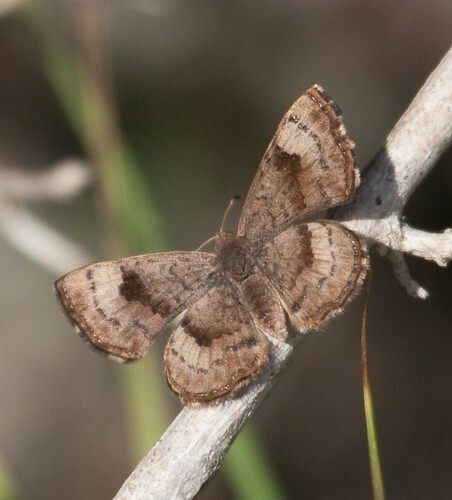 On the way, I got a basking Carolina Satyr but not much else. 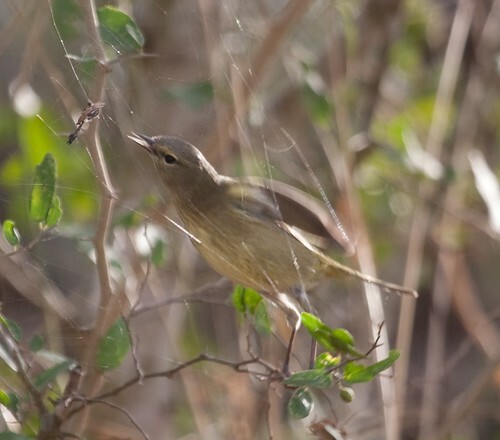 There was no sign of the Dusky-capped Flycatcher that had been reported. At the car, I grabbed the ipod and confirmed that it was a Couch’s, yet another lifer (unless I count the one at Santa Ana instead). At this point, I headed towards Weslaco. I was planning on attending the bird walk at Estero Llano Grande in the morning and wanted to stop somewhere in that area. I forgot to check exactly where Weslaco is in relation to everything else and when I got tired, I stopped at the first hotel I found. I’d later figure out that I was in San Benito and should have continued for another 20 minutes, but I was tired enough not to care. I was in the mood for a burger and put Whattaburger into the GPS. Following the directions, I saw one and pulled in. It was pretty good for fast food, but not great. Back at the car, the GPS offered to continue finding it. Since the hotel had no wireless, I went to look for a Wal-Mart and see if they had any cheap patch cables. Unfortunately, the GPS said I arrived and all I saw was a vacant lot. I decided to manage without internet for the night. I had requested the room for two nights but when I stopped at the desk to say I’d be moving on, the person said she had only checked me in for one, so it worked out. I went back to the room and collapsed (my allergies had really started acting up and I would later hear that the mountain cedar pollen count was into the thousands). 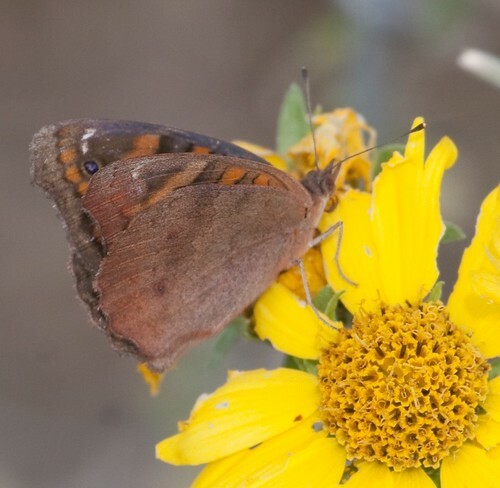 Today I planned on spending the morning at Santa Ana NWR and then heading over to Bentsen for the afternoon butterfly walk. That proved to be a good plan. I reached Santa Ana at 8 and checked in at the visitor center. I was going to pay cash, but when I mentioned that I had a duck stamp the person at the desk got all excited that someone would actually use one. I grabbed a trail map and started out. 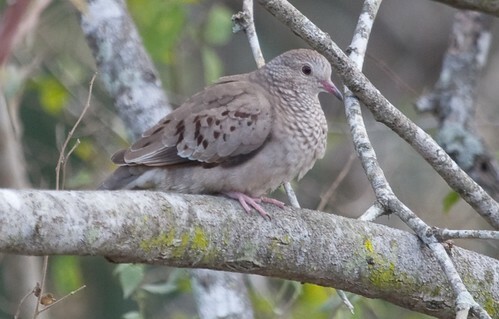 I started at the Chachalaca Trail and immediately had an Olive Sparrow. Quite the skulker. 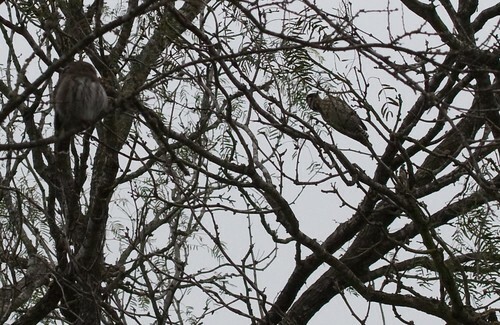 A few feet further, I had a better view of Long-billed Thrasher but still not great. At the overlook, there were a bunch of grebes, including several Least, along with many teal and a few yellowthroats. Continuing on to the lookout, I finally got better views of the thrasher and sparrow (got photos of the thrasher as it turned away). At the blind, I caught a brownish bird down near the water. 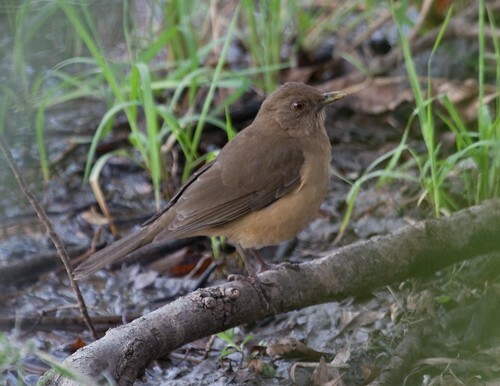 It took a few seconds for it to click in, but it was a Clay-colored Thrush (formerly Robin)! One of the birds I really wanted to see. But yikes it was dull. It posed for a series of shots (all at the same angle though). 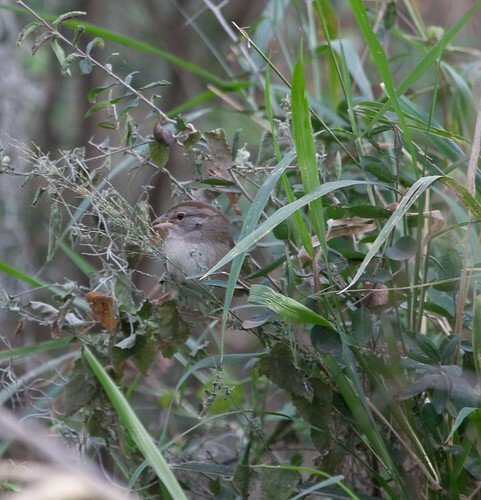 At the blind, I got my first moorhen of the trip and there was a Carolina Wren working where the robin had been. Moving on, I came across an Olive Sparrow sitting up, almost in the open. It appeared to be eating and stayed still for several photos. Back at the start of the trail, I ran back to the car for a quick snack and found two Plain Chachalacas by the headquarters. They didn’t stick around for good views, so I moved on to the Willow Lakes trail. 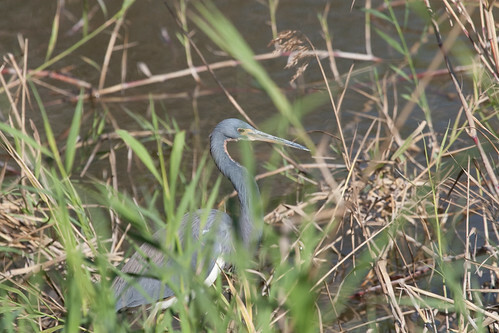 It was fairly quiet and I branched off to the Cattail Trail. Shortly down there, I had a couple birds pop up. Clay-coloreds! And there was a third one chupping nearby. And then 10 yards further were two more calling! I can’t say with 100% certainty that there were no repeats, but I think there was a flock of 5. 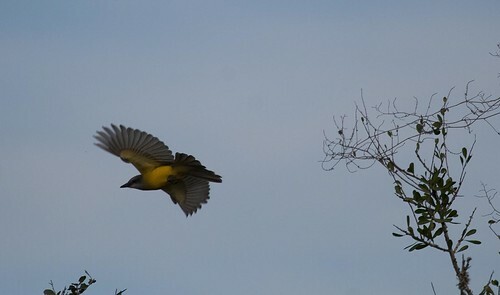 The trail soon opened up and a White-eyed Vireo popped up, followed by a few Kingbirds. Unfortunately, they moved way into the back trees and stayed silent, so I had to let them go as Couch’s/Tropical. I also heard something that sounded vaguely like a Spotted Towhee around here. I continued on and eventually reached a dirt road, which had the only roadrunner of the trip run across. I wandered in the direction of the water that was nearby and found a large flock of swallows overhead. They appeared to be Cliff or Cave but the light was awful. I was having a hard time making them into Cliff, but since I still haven’t caught up with any of the November Caves in Mass I let them go for now. The water was not overly interesting (a Kestrel, a Golden-fronted Woodpecker, and a bunch of skittish ducks) so I turned around. The swallow flock returned and I felt more convinced that they were Cave and even managed a few pictures. 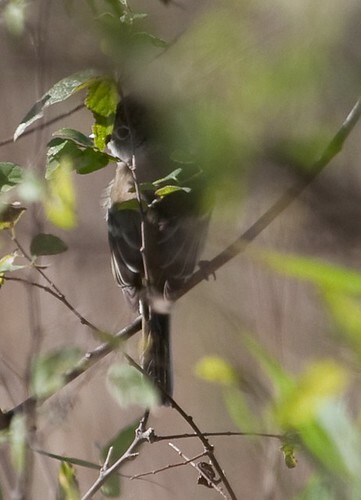 Back near the kingbird spot, I found a single bird on the other side of the trail. I grabbed the camera and lucked into one shot as it flew off. 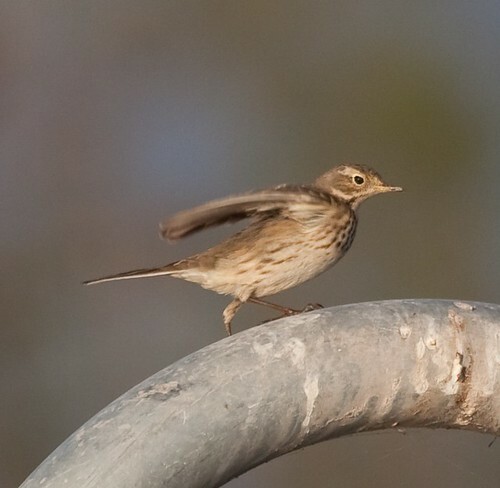 If the wing is spread fully and I’m reading Pyle properly, it’s more likely a Couch’s (and in a bit of foreshadowing, listening to vocalizations the next day, I noticed that Couch’s have ones that sounded like what I thought was a towhee). Back at the Willow Trail, I started around that part of the loop. 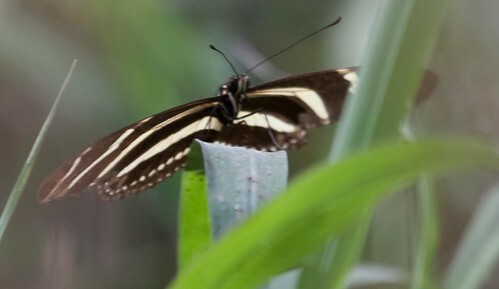 Just before it opens up, my first Zebra fluttered out but it was pretty quiet otherwise. 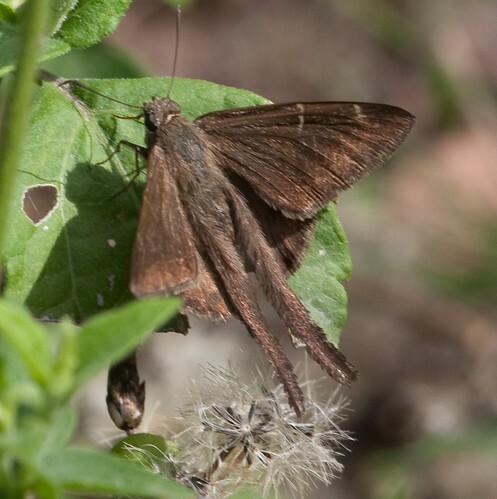 Near the photo blind were a few White-Skippers that I eventually identified as Laviana and a Snout. 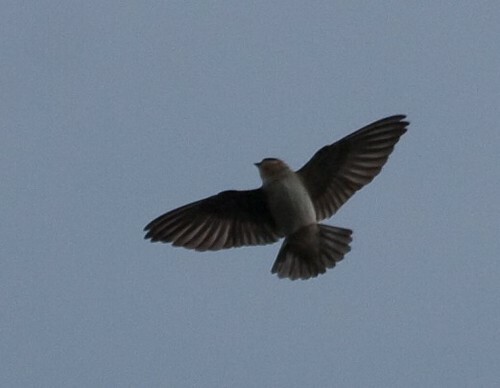 A few other things including a Longtail flew by but none that I could identify. I moved on to the tower, which turned out to be a waste. The view was nice but it really needed a few signs telling you what you were looking at. I zipped back to the car and had lunch (cookies and a mineola). The mineola had 3 seeds per segment, which made for quite a mess. And of course, at the hotel the next day, I had the other one I bought and it had 2 seeds total. 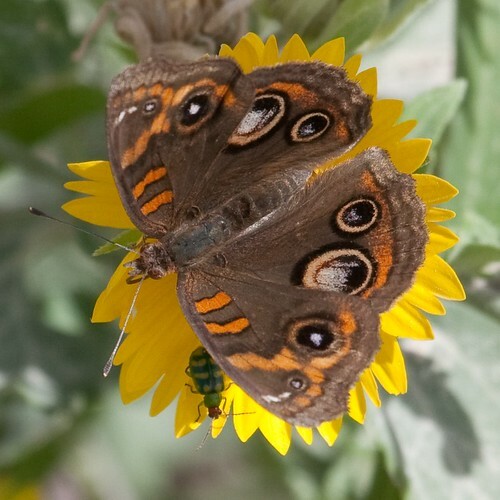 At that point, I drove over to Bentsen and got there just in time for the butterfly walk to start. The crowd was a bit more beginner than I would have liked, but I can’t complain when 75% of things were new to me. We worked the gardens by the headquarters for a while and then caught the tram to the gatehouse. At the gatehouse, the first thing from the leader was “uh oh, there’s Mike and he’s waving.” We ran over and found out that he had just found a Chestnut Crescent. 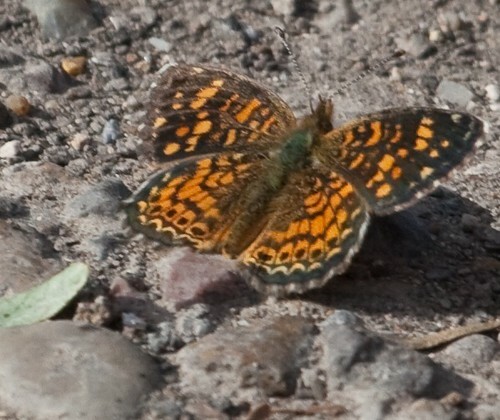 I’m not totally sure, but there’s probably less than 10 US records, so it was quite a nice butterfly. 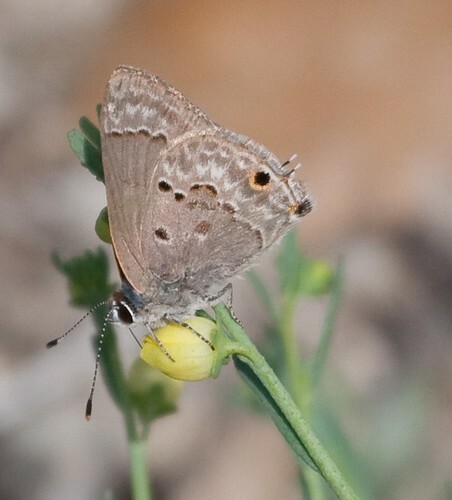 Also in the area were Vesta and Phaon Crescents, a Great Southern White, and a bunch of skippers including Fawn-spotted and Brown Longtail. We then caught the tram back (but not before one of the park volunteers ran up and asked if we heard him shouting Hook-billed a few minutes ago, ack). He also had seen the Orange-breasted Bunting that I hadn’t even been aware of, but since I wanted to get to Brownsville, I didn’t look today and figured I’d come back later. Back to the car and off for Brownsville. I was pretty tired and checking through the listings at the hotel, I saw that there was a Rudy’s nearby. I drove over and got a half pound of brisket, which meant I had lunch for the next day as well (wish I remembered to get the lean instead). I started looking through the guides for tomorrow. I was planning on heading to Laguna Atascosa and South Padre before getting to Sabal Palm, but I didn’t feel up for the long drive and remembered that a new center had just opened, Resaca de la Palma. I decided to head there instead. 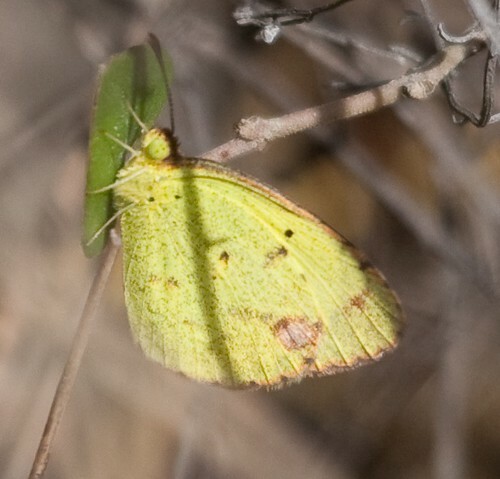 If I’m counting correctly, this is the 100th butterfly species I’ve photographed (not sure which one was #100 observed but it was also at Bentsen and Large Orange Sulphur is most likely). I woke up about 7, confirmed that I still couldn’t figure out how to access the hotel wireless and also that the shower didn’t appear to be working (although I think I got this figured out by the next hotel). I took a look out the window and noticed a bunch of birds on the water. Setting up the scope quickly, I found them to be mostly American Coots and Blue-winged Teal with a few blackbirds mixed in. After the standard hotel breakfast, I went back to the room to pack up and get going but took another look out the window and ended up spending close to 30 minutes watching. 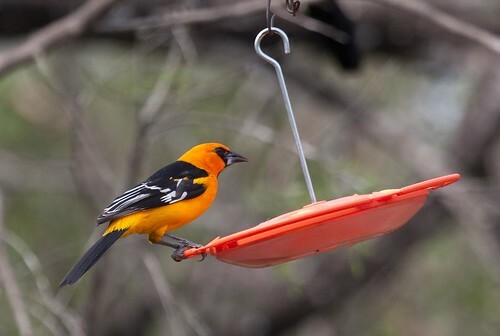 By far the best thing was an oriole that appeared to have an orange head and black throat. I couldn’t make it into anything but an Altamira, which was the first life bird of the trip (bad views of life birds would be a common pattern for awhile). Eventually it moved on and a Vermilion Flycatcher replaced it! 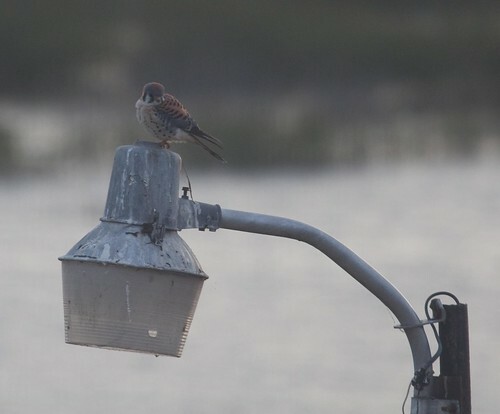 As I finally got ready to go, an American Kestrel came in and landed on the light pole right outside the window. 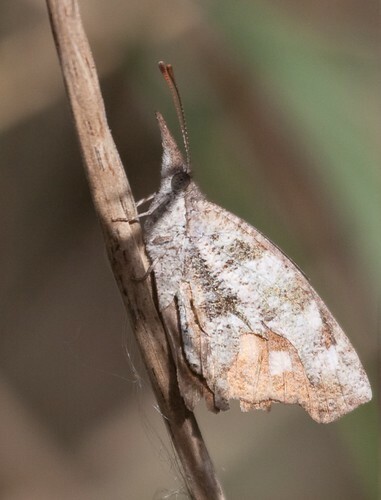 Little did I know how common they were in the area. I finally got going and checked out. On the way out, I took a walk around the hotel. The view from the ground wasn’t as good, but I did pick up a few Yellow-rumps. The first stop I made was at the Zapata Public Boat Ramp (LTC-085 mentions it). Apparently it’s a big fishing area (I forgot to take a picture of the hotel parking lot, but it was 90% pickups with trailers and boats). 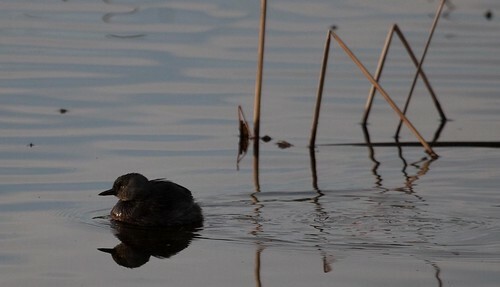 At the water were more coots and some Neotropic Cormorants (I think, cormorants trouble me). 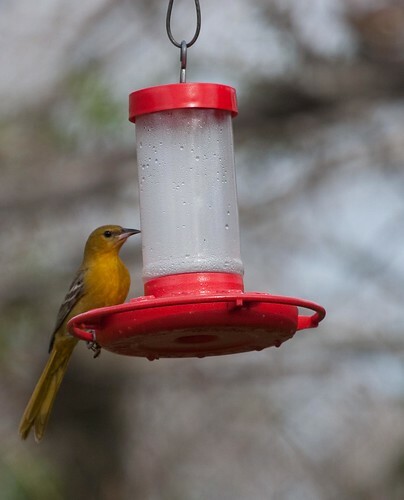 I walked up the road a bit and found a bunch of Orange-crowned Warblers (probably more than I’ve seen total in Massachusetts) and the only House Finches of the trip. There were a couple Ruby-crowned Kinglets mixed in as well and Laughing Gulls and American White Pelicans flew over. After the boat ramp, I went looking for the city park to check for White-collared Seedeater. On the way out from the boat ramp, I got a quick look at a Green Jay in someone’s yard, life bird number two. I missed the turn for the park somehow and decided to head up to San Ygnacio (LTC-087) instead. Upon arriving there, I took a quick look around but didn’t feel comfortable by myself and headed back toward Zapata. On the way I got yet another lousy life look when a Crested Caracara flew over. There were also a couple Chihuahuan Ravens along the side of the road and some Eurasian Collared Doves as well. A couple Black Vultures overhead were nice. I took a quick trip down the Hebbronville Scenic Drive (LTC-086), or at least in the general direction. Lots of kestrels on the wires and at least 5 Caracaras as well. Meadowlarks flushed regularly, but I never was able to figure them out (for the entire trip actually). Eventually, I made my way over to Falcon State Park, arriving at about 10:30 and picking up Loggerhead Shrike and Lark Sparrow along the road in. I pulled up at the gate but the window appeared closed so I pulled in to the parking lot to pay. Started to walk over to the self pay station and someone walking by tells me that this is the employee’s entrance and the visitor entrance is over there. So there were people in there. I went in, paid, and grabbed a map. It was a bit windy, but I decided to walk the nature trail for a few minutes at least anyway. I ended up spending a couple hours walking around. Early highlights on the trail included a huge flock of cormorants going by. I took 4 photos of different parts of the flock and don’t think I got them all. 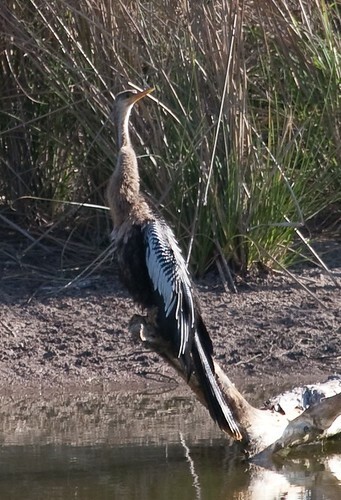 Here’s one, anyone want to comment on which cormorant? You probably want to click through and hit all sizes to get a decent look. 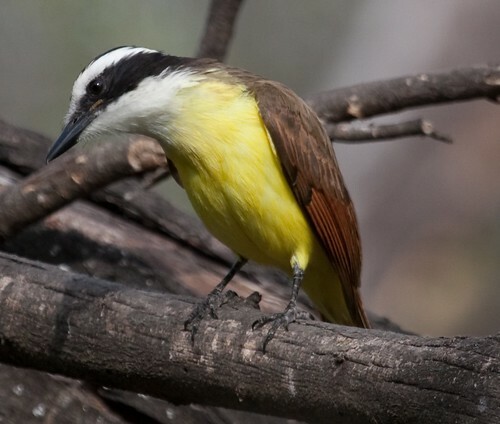 I got two more life birds on the walk in: a lousy look at a Great Kiskadee as it flew over and a better look at Black-crested Titmice. Other good birds included several Pyrrhuloxia, White-eyed Vireos, and good numbers of gnatcatchers. I spent some time working the gnatcatchers and could only come up with Blue-gray. There were also lots of bugs around here. 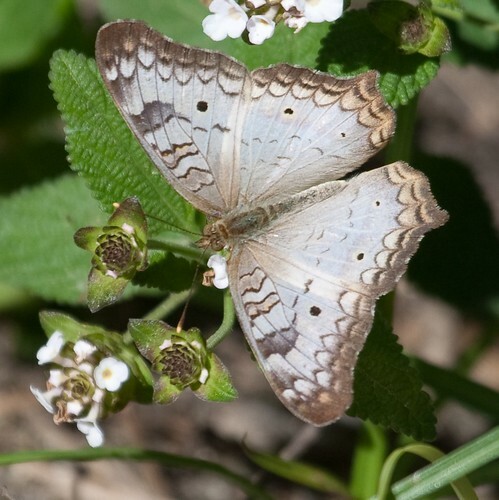 Butterflies included my first Queen, Gulf Fritillary, Reakirt’s Blues, and Little Yellow along with Ceraunus Blue, Dainty Sulphur, and White Checkered-Skipper. 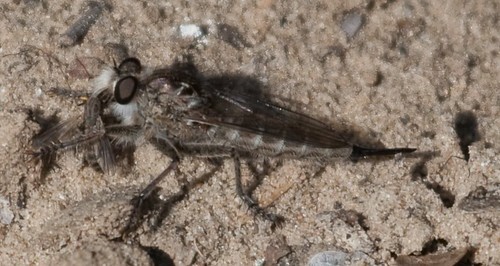 There was also a Familiar Bluet or two and a good number of Robber Flies. The experts aren’t sure about the robbers (probably because of the picture quality) but there apparently aren’t any species expected in January. On the way back, I heard a bit of scratching in the brush and eventually found a Long-billed Thrasher but yet again had lousy looks. 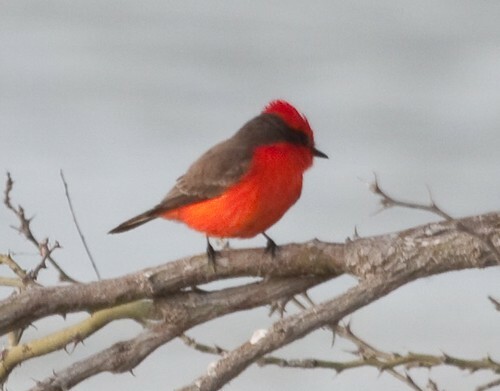 I stopped at the boat ramp where there was another Vermilion Flycatcher. I started down the trail from there and flushed an interesting dragonfly off the ground. It landed and I was able to snap one photo before it flew off again, moving along the path about 2 feet off the ground until I lost track of it. 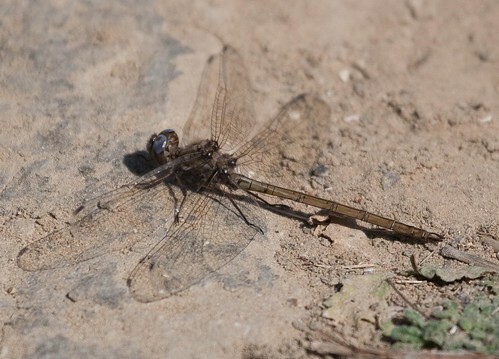 Checking out the photo later, I expected one of the pondhawks, but it turned out to be a Straw-colored Sylph. The date ranges I can find for that appear to be April to November, so it’s quite an extension. Whether that’s early or late I’m not sure but it was the first of several seasonal extensions I found. It was also ode #100 for me. 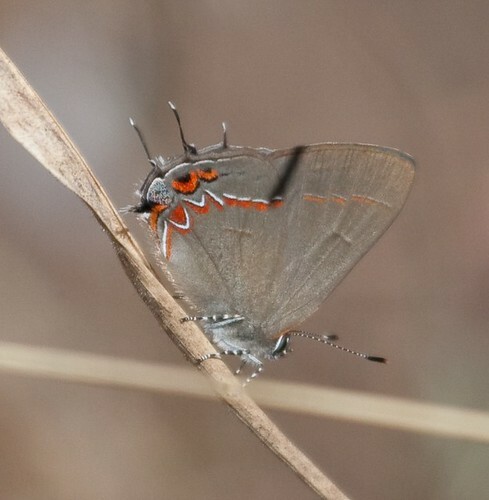 Other things along the trail included a female Band-winged Dragonlet, a Wandering Glider, a Checkered White, a Mallow Scrub-Hairstreak, a Fatal Metalmark, and a Texan Crescent. Birds weren’t overly plentiful and I headed back to the car fairly quickly. Once back at the car, I drove around a bit and then headed out. 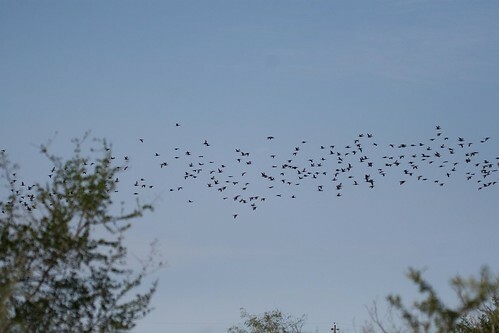 On the way, I flushed a flock of pipits. 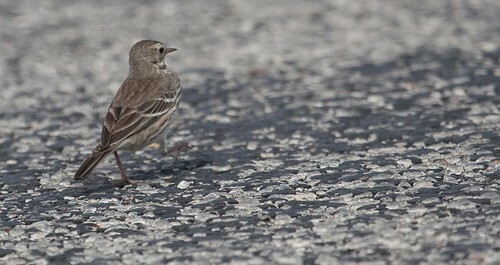 Most flew off, but one stayed on the ground and ran around, giving me time to roll down the window and get a few shots. The next stop was at Salineno. For those who haven’t been, it’s a tiny spot along the Rio Grande. It was formerly a trailer park populated by birders but has since been transfered to USFWS. 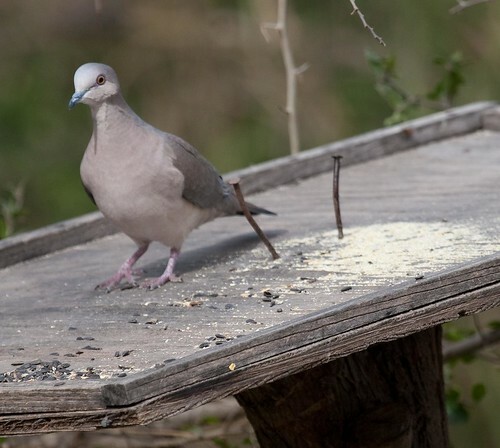 One birder still lives there and has a huge number of feeders set up. You can wander in to the yard, sit down, and watch. It was absolutely spectacular with tons of Texas specialties flying around and making lots of noise. 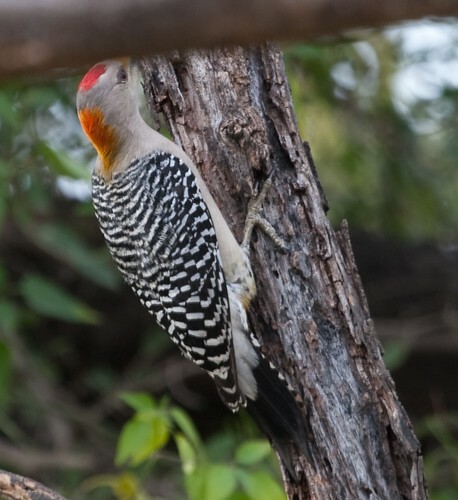 In 20 minutes, I had about 20 species including another three lifers (Audubon’s Oriole, White-tipped Dove, and Golden-fronted Woodpecker). But I also finally got good views of Altamira Oriole, Green Jay, and Great Kiskadee, in addition to Inca and White-winged Doves, Ladder-backed Woodpecker, and the only Chipping Sparrows of the trip. A Lincoln’s Sparrow also popped up, which was a highlight until I discovered that they were the most common sparrow around. After watching the feeders, I went back to check on the car. The nonbirder type had been down at the river and there aren’t too many people who go down there for legal things other than birds. Fortunately, he had left and I spent a few minutes watching the river. 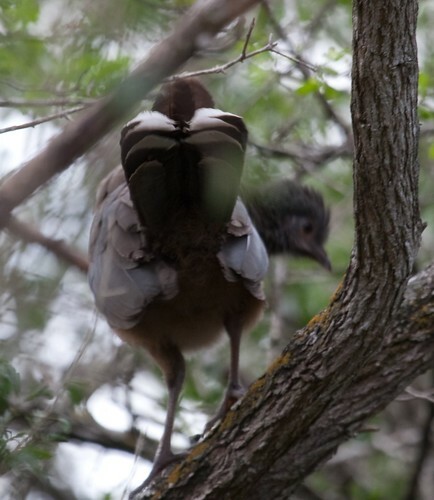 There was something big in the trees where the Red-billed Pigeons are supposed to hang out but after I set up the scope it turned out to be an Osprey. A car of birders from Alabama drove up and I spent a few minutes talking to them while we waited for Muscovies to flew by (which never happened). Apparently there were Olive Sparrow, Clay-colored Thrush, and a few other things at the feeders earlier and a Green Kingfisher along the river. I wandered down the path a bit after they left, but other than a Sharpie I didn’t find much. I also did manage to build up a list of birds on the Mexican side of the river (some ducks and herons and blackbirds flying over), so I now have a 6th country I’ve seen birds in. Leaving Salineno, I got back on the highway for the drive to Mission. The GPS didn’t seem to be able to find my hotel (Hawthorn Suites) but I got there after a little bit of circling. Quite nice, although I probably didn’t need a suite or the two table settings that were provided. Dinner was at the first place I found, a Chili’s. About what I expected, acceptable and would have been good if they trimmed the steak properly. 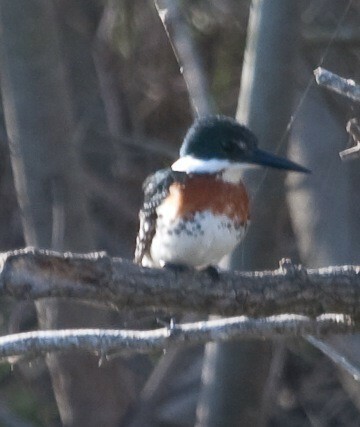 Oops: I managed to forget that as I was driving along the highway to Mission, I came across two kingfishers together. One was huge and had to be a Ringed (yet another lousy life look). I think the other was a Belted, but it was hard to tell at 70MPH. Double oops: The Long-billed Thrasher appears to be world #500! Day 0 was a travel day, flying from Boston to San Antonio with a stop in Atlanta and then driving south to Zapata. Up at 6, off to the airport by 6:30. A crow, some gulls, and a red-tail along the way. Got dropped off, walked in, checked my bag and cleared security in about 10 minutes. I found the gate, which was being used for an earlier flight and settled in nearby. An amusing moment came when a TSA agent walked over and shouts to someone sitting a row over that he left his keys at the counter. He went running back and after returning kept cracking up every few minutes. The flight took off right on time and was pleasant, even though I was stuck in a middle seat (maybe I should have paid the $6 to pick the seat out ahead of time). Halfway through there was a page for any medically trained person. Nothing appeared to be happening until just before we began the descent when the two people in the first row moved and an older man and woman took those seats. The man was given an oxygen tank and they announced that there would be an ambulance at the gate. Once we landed in Atlanta, two EMTs came aboard. I was sitting close enough to hear the general story. Apparently the guy had a pacemaker put in about a year ago and it was malfunctioning a bit and he blacked out. Once he got the oxygen, he appeared to be doing much better and was probably ok by the time we landed. And even with waiting for the EMTs to take him off, we still were out early (presumably we had cut all the lines to get to the ground). The gate for the next flight was only a few down, so I walked around a bit checking out all the food. I eventually settled on Popeye’s, which was quite good (and my 3 chicken strip meal came with 4 pieces of chicken for some reason). After that, it was a fairly long wait for the next flight. We eventually boarded. This time, I had an aisle seat (on the 2 seat side). Again, the flight was very pleasant. The landing in San Antonio was a bit rough for no apparent reason but an extra bounce is still not much. My bag came off the carousel quickly and a Hertz shuttle was pulling up as I got outside. After a quick trip to the Hertz location, I got the standard “oh, we don’t have the car you rented available” but they did have a Mazda 6 (instead of a Ford Focus) for a couple dollars more and then started applying various discounts so who knows how much different it actually was. Soon enough, I was handed a set of keys and out at the car. I grabbed the lever to open the trunk and instead popped the hood. Apparently the trunk was the thing that didn’t really look like a button next to the lever. Once settled into the car, I entered Zapata into the GPS and started out. Inside the packet of information Hertz gave me was a note that the airport expansion has made a mess of the roads right there and old directions don’t work. I didn’t see that until much later and ended up driving in circles and entering areas that didn’t look like the public was overly welcome for a few minutes before I decided to just start for a highway and assume things will figure themselves out. Sure enough that worked. The GPS recalculated and had me going in the right direction almost immediately. Other than a fast merge across 3 lanes, it was quite easy to get onto I35 and start south. Even though it was about 6PM, it was still light enough to see the flocks of grackles, a cormorant, some pigeons and starlings, and a few vultures and Buteos as I headed south. The road emptied out pretty quickly. The GPS had issues with the business road (it told me I was off the route every time I passed an exit for a good 100 miles) but otherwise there were no problems. It worked well as the highway ended in Laredo (which was good, as it didn’t look nice) and got me to the next part with ease. I stopped at a Subway in the middle of nowhere. It was at a truck stop and was rather interesting to hear broadcasts that shower 1402 was now ready over a loudspeaker as I was eating. I reached Zapata by 9:30 or so and found my hotel (the Holiday Inn Express) easily.